Imagine waking up feeling gorgeous? Looking stunning while at the gym, during a wedding or at the beach? Well, imagine no longer – our eyelash extension services make those dreams a reality! Eyelash extensions offer a semi-permanent extension to your actual lashes. Lash extensions are professionally placed on, one at a time, to your individual eyelashes. They provide you with the eyelash volume, length and color that you have always desired – all while looking naturally amazing. We customize every set of extensions to meet the client’s specific needs – whether it is Hollywood-glam or simple-yet-full. Our standard fill, every 2-3 weeks.Cost of service is subject to change based on length of time between visits. 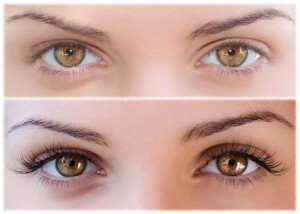 NOTE: We strongly recommend that lash fills occur every 2 weeks to maintain your lash extensions. Beyond 3 weeks, fills are NOT available, and a Full Set is then required. You will be charged according to time needed to fill lashes. NO EXCEPTIONS. All lash clients history will be reviewed prior to making appointment to determine the length of time needed for fill.